HEALTH ECONOMICS BLOG - Trends, Politics, Opinions etc. 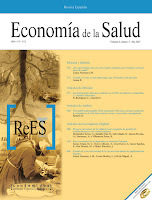 in biotech & pharma industry: the latest edition of the Spanish journal of health economics is out..
the latest edition of the Spanish journal of health economics is out.. Topics in this edition: Spanish NHS and healthcare cost optimization, cost-effectiveness of HPV vaccination in Spain, QoL in coronary syndrom patients, discussion around NICE and diabetes drugs etc. You can read all articles online..